Celtic progressed to the Champions League play-off round as a goalless draw in Baku allowed them to complete a 1-0 aggregate win over Qarabag. An excellent save by Craig Gordon denied Qarabag's Richard Almeida midway through the first half. Stuart Armstrong and Stefan Johansen fired shots wide for the visitors after the break as openings remained scarce. Ronny Deila's side are now two legs away from the group stage and will discover their opponents on Friday. 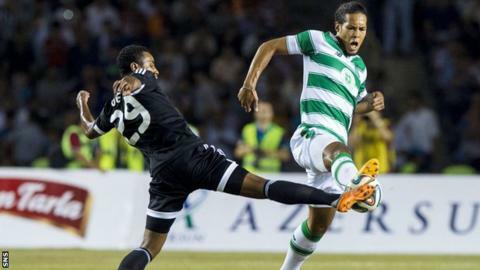 Dedryck Boyata's headed goal from the first leg sealed Celtic's seeded place in the draw, while Qarabag dropped into the Europa League play-off round. There had been concerns about the pitch at the Tofiq Bahramov Stadium following reports the surface had been badly damaged by the heat. However, Deila had dismissed suggestions that either the pitch or the heat in the Azerbaijan capital would hamper his side's chances. Celtic, fielding an unchanged starting line-up from last Wednesday, absorbed pressure from the hosts in the opening half-hour but had few direct efforts at goal to deal with. Gordon flapped at a cross and Rydell Poepon could not take advantage but the goalkeeper was much more convincing when he beat away Richard's effort. The Brazilian lined up his left-foot shot from 22 yards and curled the ball towards the inside of Gordon's right-hand post only to be left frustrated by the Scotland international's stretching save. In attack, the visitors were restricted to breakaways and rarely got into dangerous areas. Nir Bitton attempted to catch Ibrahim Sehic out with an audacious shot from near the centre circle, the keeper clutching after a momentary panic. Alharbi El Jadeyaoui tried a chip of his own early in the second half but Gordon comfortably caught the 20-yard shot. Though Qarabag's attacking continued to stutter, Celtic became less and less able to mount meaningful advances and their passing often let them down. However, Armstrong sought to break the malaise with a shot from the left that had power but lacked accuracy. As the game entered its closing stages, Johansen had only Sehic to beat as he latched on to an Armstrong pass but could not hit the target. James Forrest injected fresh pace as a replacement for Armstrong and his forceful, driving run took him clear of the Qarabag defence, but he elected to pass instead of shoot and the hosts scrambled clear. After five minutes of stoppage time, the Celtic players were celebrating and will now contemplate the challenge of overcoming their final hurdle to the Champions League group stage. Match ends, FK Qarabag 0, Celtic 0. Second Half ends, FK Qarabag 0, Celtic 0. Attempt blocked. Richard Almeida (FK Qarabag) left footed shot from outside the box is blocked. Assisted by Elvin Mammadov. Foul by Cavid Tagiyev (FK Qarabag). Mikael Lustig (Celtic) wins a free kick in the defensive half. Emilio Izaguirre (Celtic) is shown the yellow card. Afran Ismayilov (FK Qarabag) wins a free kick in the defensive half. Substitution, FK Qarabag. Cavid Tagiyev replaces Dani Quintana. Attempt missed. Stefan Johansen (Celtic) left footed shot from the centre of the box is close, but misses to the right. Assisted by Stuart Armstrong. Attempt missed. Badavi Huseynov (FK Qarabag) right footed shot from the left side of the box is high and wide to the right. Assisted by Rasad F. Sadiqov following a corner. Corner, FK Qarabag. Conceded by Dedryck Boyata. Attempt missed. Afran Ismayilov (FK Qarabag) left footed shot from the centre of the box misses to the left. Assisted by Ansi Agolli with a cross. Substitution, Celtic. Kris Commons replaces Gary Mackay-Steven. Delay in match (FK Qarabag). Foul by Elvin Mammadov (FK Qarabag). Offside, FK Qarabag. Gara Garayev tries a through ball, but Afran Ismayilov is caught offside. Substitution, FK Qarabag. Elvin Mammadov replaces Alharbi El Jadeyaoui. Attempt missed. Nir Bitton (Celtic) right footed shot from more than 35 yards is too high. Attempt blocked. Scott Brown (Celtic) right footed shot from outside the box is blocked. Assisted by Stefan Johansen. Substitution, Celtic. Leigh Griffiths replaces Nadir Ciftci. Attempt blocked. Alharbi El Jadeyaoui (FK Qarabag) left footed shot from the left side of the box is blocked. Assisted by Afran Ismayilov with a cross. Ansi Agolli (FK Qarabag) wins a free kick in the defensive half. Substitution, FK Qarabag. Afran Ismayilov replaces Rydell Poepon. Stefan Johansen (Celtic) is shown the yellow card for a bad foul. Rydell Poepon (FK Qarabag) wins a free kick in the attacking half. Attempt missed. Stuart Armstrong (Celtic) right footed shot from the left side of the box misses to the right. Assisted by Gary Mackay-Steven. Attempt saved. Alharbi El Jadeyaoui (FK Qarabag) left footed shot from outside the box is saved in the top centre of the goal. Assisted by Ilqar Qurbanov. Dani Quintana (FK Qarabag) wins a free kick in the attacking half.